LOOK SWEET: Crown the holidays with some cuteness-coordinating style. You’ll love the candy cane print that gets the holiday spirit going in colorful fashion. 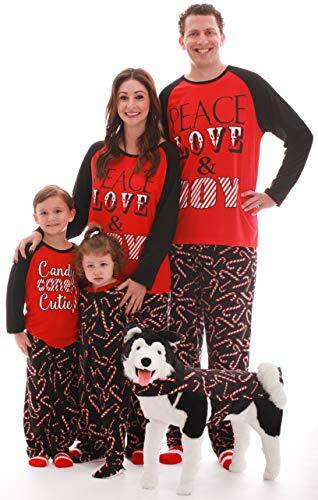 Rock these matching Christmas pajamas during the fall season, when taking holiday photos, lounging as a family, or as a cute couple. ALL SIZES: No one has been left out of the matching fun, even the family pooch. These Christmas jammies are available in newborn, toddler, kid’s, women’s, men’s, and dog jacket sizes. The newborn and toddler Pjs come as one-piece footed blanket sleepers while the rest are 2-piece jammies with striped socks. COMFY GOODNESS: Whether you’re sleeping or lounging, these Xmas pajamas treat you to snuggle-worthy comfort all through. We’ve used microfleece fabric to make the Christmas pajamas for kids and adults extra-soft and comfortably warm; you’ll want to live in them. Make those holiday photos pop; show up to that slumber party in style; kick back with your better half in extra cute fashion. These matching Christmas jammies are designed to make every moment a jolly affair with a candy cane-inspired print. And we’ve ensured no one is left out of the festive fun by designing them in just about every size. There is a fit for everybody from that new bundle of joy you just brought home, good ol’ grandpa, to the cherished family pet. Yup! There is a matching dog jacket available in XS-XXXL, so no matter the size of your pooch, they are able to be part of the festive goodness. Experience coo-worthy comfiness in play! You can love the fabric that treats you to softness you won’t need to slip out of. And we’re talking about head-to-toe comfort here. The newborn and toddler Pjs come as footie blanket sleepers, whilst the children’s and adult sizes come as 2-piece pajamas complete with striped socks to keep your tootsies toasty. The men’s and women’s pajama tops are made the use of a breathable blend of 55% cotton and 45% polyester jersey fabric, whilst the pants, socks, and the rest of the sizes are 100% mirofleece polyester. – All of the kids’ pajamas are flame-resistant for extra safety. – The adult pajama pants have 2 side pockets. – A full zipper on the blanket sleepers makes for easy wear. – Wash well without losing their softness or color. – Backed by a 100% customer satisfaction guarantee. Click ‘Add to Cart’ now to crown the holidays in standout matching fashion! LOOK SWEET: Crown the holidays with some cuteness-coordinating style. You can love the candy cane print that gets the holiday spirit going in colorful fashion. Rock these matching Christmas pajamas throughout the fall season, when taking holiday photos, lounging as a family, or as a cute couple. ALL SIZES: No one has been left out of the matching fun, even the family pooch. These Christmas jammies are available in newborn, toddler, kid’s, women’s, men’s, and dog jacket sizes. The newborn and toddler Pjs come as one-piece footed blanket sleepers whilst the rest are 2-piece jammies with striped socks. COMFY GOODNESS: Whether you’re sleeping or lounging, these Xmas pajamas treat you to snuggle-worthy comfort throughout. We’ve used microfleece fabric to make the Christmas pajamas for kids and adults extra-soft and comfortably warm; it would be best to live in them. THOUGHTFULNESS IN DESIGN. It’s the little things that make these Christmas Pjs extra special. The blanket sleepers have a full zipper for easy wear, All of the kids’ pajamas are flame-resistant, and the pajama pants for women and men have 2 side pockets. GREAT VALUE: #followme is all about giving you the latest fashion at the best prices around. Click ‘Add to Cart’ now to get family Christmas pajamas created with supreme comfort, great quality, and unique style in mind, all without breaking the bank!